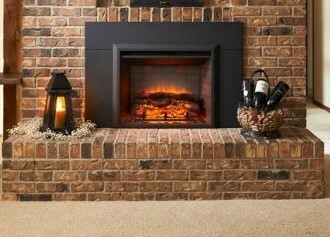 Just plug in one of our Gallery Collection electric fireplaces for instant ambiance in any room. Our zero-clearance electric fireplace insert models are CSA tested for safety, go with any room style, and are easy to use. They are cool to the touch but will add warmth to any space. With two size fronts this insert fits most sizes of existing masonry and zero clearance wood-burning fireplaces. Turn any traditional fireplace into an easy-to-use, clean, and efficient electric fireplace in minutes.